TEHRAN, Iran (CNN) -- Tens of thousands of demonstrators took to the streets of Iran's capital for the sixth day in a row Thursday to protest election results they consider fraudulent. 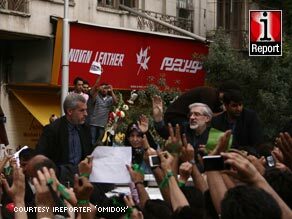 Mir Hossein Moussavi (right, in green sash) greets supporters at Thursday's rally. Some estimates put the total number of participants in the hundreds of thousands. The election's putative loser, Mir Hossein Moussavi, spoke through a bullhorn from atop a building to the throngs of marchers who snaked through the city in what was described as a peaceful protest of last week's presidential vote. He spoke hours after the Iranian government agreed to meet with candidates to discuss complaints stemming from the contested election, a journalist at the scene told CNN. President Mahmoud Ahmadinejad, whom the government has said won the election by a huge margin, has not made a public appearance since Sunday, when he compared the protesters to soccer fans whose team had lost. The government refused to allow international reporters to cover Moussavi's remarks, but messages sent on the social networking site Twitter said he talked about the country's economic problems and corruption. "Twenty-five percent inflation means ignorance, thieving, corruption, where is the wealth of my nation," Moussavi said, according to a Twitter message. "Iran must participate in fair elections, it is a matter of national importance," the messages quoted him as saying. The present Iranian government is not what Ayatollah Khomeini, the leader of the 1979 Islamic revolution, would have wanted for Iran, the Twitter messages quoted him as saying. CNN could not confirm the authenticity of the messages. Moussavi, 67, was a confidant of Khomeini. He also was the prime minister of Iran in the early years of the Islamic Republic and during the country's brutal war with Iraq in the 1980s. Demonstrators -- also wearing bands of green, a color adopted by Moussavi supporters -- started their rallies from mosques across the Iranian capital and planned to converge in a city square Thursday afternoon. They marched en masse from the location, Imam Khomeini Square, near the city's Grand Bazaar, along city streets in what is expected to be one of the largest protests since last Friday's disputed election. The government said President Mahmoud Ahmadinejad won that election a huge margin. The significance of the starting location is that many demonstrations staged against the Shah of Iran's regime three decades ago by supporters of the Islamists now in power took place there. The journalist told CNN that people converged into the Imami Khomeini Square, getting there from the subway and on bikes, cars, taxis and on foot and then they snaked through streets toward Revolutionary Square near Tehran University. Conditions were more relaxed and less vocal than the day before. Marchers drank juice and mineral water as they tramped through the streets. The journalist said there were no reports of injuries and that he only saw ordinary police on the scene -- not anti-riot police. The Moussavi had asked his supporters to dress in black Thursday as a sign of respect for those who died or were wounded "as a result of illegal and violent clashes" with his opponents. As the protests over the elections mount, Iranian officials have reacted. Ayatollah Ali Khamenei, Iran's supreme leader, has appealed to the citizenry to stand behind the Islamic republic. He is to deliver a sermon during Friday prayers at Tehran University, the Basji militia said. Another opposition candidate, Mehdi Karrubi, has called for demonstrators to march to the spot where the supreme leader is scheduled to speak on Friday. The Guardian Council -- which supervises the county's elections -- said Thursday it was looking into the complaints and that opposition candidates Moussavi, Mohsen Rezaie, and Karrubi have been invited to attend the upcoming meeting of the panel. The pro-Ahmadinejad FARS news agency said Thursday that the daughter and brother of former President Ali Akbar Hashemi Rafsanjani were barred from leaving the country. The daughter was seen speaking Wednesday at a pro-Moussavi rally where she reportedly spoke in his favor. Rafsanjani's role as chairman of the Assembly of Experts -- which is responsible for appointing the supreme leader and monitoring his performance -- gives him the ability to influence that body's attitudes toward Khamenei. Daily protests have claimed at least eight lives, according to Iran's government-funded Press TV. Seven of those were protesters killed after they attacked a military post following a rally on Monday, the government said. Counter-demonstrations by Ahmadinejad backers also have drawn thousands, reflecting a fissure in the country. There have been several incidents of violence, some of which Moussavi supporters blamed on backers of Ahmadinejad and some on the Basij, a volunteer paramilitary force that takes orders from the government. Intelligence Minister Gholam-Hossein Mohseni Eje'i said the ministry has a responsibility to "arrest and prosecute members of 'some groups which enter public rallies and attempt to cause unrest and chaos.'" Iran said it was investigating reports of violence at a Tehran University dormitory, and Iran's parliament Speaker Ali Larijani blamed the Interior Ministry for the raid on the dorm and attacks on civilians. Larijani's comments are seen as an unprecedented rebuke to Ahmadinejad, who has been taking heat from many religious conservatives who've knocked the president's criticism of protesters. And such criticism reflects an unprecedented public airing of a rift among ruling conservatives. Authorities in Tehran have cracked down on the protests by hauling dozens of demonstrators to jail and blocking access to social networking sites, such as Twitter and Facebook. A number of activists have been swept up in the arrests, including a former Iranian deputy prime minister who headed a group supporting increased freedom and democracy as well as Moussavi's chief campaign strategist. Iran's government has also banned international journalists from covering the rallies, saying it could not guarantee the safety of reporters it has dubbed the "mouthpiece" for the "hooligans" behind the unrest. Moussavi is expected to address protesters and former Iranian President Khatami and members of the group, the Association of Combatant Clerics, are expected to participate in the rally. CNN's Samson Desta and Reza Sayah in Tehran, and Badi Badiozamani, Mitra Mobasherat and Saeed Ahmed in Atlanta, contributed to this report.